Harriett R. Curry was born September 26, 1927 and peacefully transitioned into eternal rest on September 23, 2018 joining her parents and siblings that she missed immensely. She is preceded in death by her parents Edward, Sr. and Magnolia Rose, Venus Rose, Mary Louise Linton, Hazel Bolden, Edward Rose Jr., and Lamar Rose. It was mentioned that during their rearing that Edward Sr. and Magnolia, were the only family "raising Black Roses on the hill"... because they were one of few families in Cornelia, GA that actually owned their house and property. Harriett was a nursing caregiver to many over her earlier years in Charlotte, NC, where she resided until 1979. She then moved to Columbus, Ohio where her youngest daughter, Harriett L. Watson, resides with her husband and sons. Harriett again cared for her grandchildren and also was a Certified Child Care provider. While living in Columbus, she enjoyed walking in the area of her apartment with some of the senior residents and while living there, she got to know Missionary Linda Tapscott, and Mother Annie McAffee, as well as Rev Sis. Jessie Hope. She enjoyed the times that she talked with them and spoke kindly of them. She enjoyed sitting in her rocking chair and watching TV mysteries, she loved to crochet and make little dolls. Additionally, Harriett really knew how to cook those collard greens and fried chicken! She had a smile that was so infectious that it would light up the room and make your heart glad! She was a jewel and precious to us all! Harriett had a loving spirit and told her family and friends regularly that she loved them. She was known for being quick witted and had MANY what we call "Harriett-isms" that are still being used to this day. Harriett was also once a member of Zion Hill Baptist Church in Springfield, OH, where she enjoyed singing in the choir. After living in Columbus Ohio for thirty-three years, her health began to decline and she then agreed to move to Springfield Ohio, with her oldest daughter, Henrietta Curry. As her health continued to decline, she still had a smile on her face and even when she could not speak you knew she was glad to see you. During the last years of her life, she lived at Good Shepherd Nursing Home in Springfield, Ohio. Harriett had many people at Good Shepherd that were like family to her and we were very happy that those people helped to make her time there enjoyable. 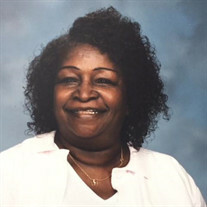 Harriett will be sincerely missed by her loving family: Daughters: Henrietta Curry (William House), Harriett Watson (Gary Watson, Sr., deceased). Grandchildren: Diana (Vincent) Bray, Lisa Curry (Charles Thornton), Gary Watson, Jr., Matthew (Kelley) Watson, Nicolas Watson. Special Great-Grandson Jermaine (Arricka Boyd) Bush, Great-Grandsons: Trinity St. John Williams, Zion Williams, Eden Williams. Great-Great Grandson Jermaine Bush II.